To quote Angie's review of Ys Uzac Satin Doll yesterday, hey, sign me up! A feral floral pushed to its animalistic limit, with gardenia no less, sounds perfect. I haven't always been a Cartier fan girl, but Baiser Volé started me on the road to conversion, and the stunning panther bottle for the new La Panthère finished me off. So when the fragrance went up for sale on the Cartier website, and I saw that they'd made the 30 ml bottle available at the outset (often, they're hard to find, or never appear in the US until much after the launch, if at all), what did I do? Well, I bought it of course. Never buy unsniffed, right? I'm usually pretty good about following my own rule, and for that matter, I don't buy much perfume of any sort, tested or untested, these days. But my resistance is low at the moment — it feels like it's been winter FOREVER — and what's more cheering than fragrance arriving in the mail? And I'm happy to report that the bottle is just as gorgeous in person, although it looks best with light shining through it (the panther is hard to make out otherwise). La Panthère opens on bright but sheer fruits; I've seen reports of rhubarb, strawberries, dried fruit, apple and apricot, but there are no notes listed in the press materials other than gardenia, chypre and musk. It doesn't matter as it doesn't smell much like any real fruits, more like a blurry, sort of apple-ish, sort of rhubarb-ish, sort of green-ish blend of spiced tart fruits, rendered nearly weightless. It changes quickly in the early stages, there are flashes of almost-recognizable-but-gone-before-you-can-decide notes; several times I was convinced there was a brief hint of anise, and yes, there's just the faintest bit of something like dried apricots. The heart, as promised, is gardenia, but it's likewise weightless and blurred. I said when I reviewed Baiser Volé that lily haters need not (necessarily) worry, lily lovers need not (necessarily) drool: that goes double for the gardenia in La Panthère, which is done here as a conceptual neo-gardenia, or, to borrow more terminology from my Baiser Volé review, it's gardenia-esque. It's not the sort of gardenia likely to give anyone a headache, or the sort that might make younger consumers worry that they smell like their mothers or grandmothers. The base is a dusky woody musk, and it's nicely mossy — not musty-mossy, like the old days, but clean-mossy; La Panthère could be a (very) modern version of a fresh chypre. The fruity undertones linger long into the dry down. The lasting power is ok, but on my skin, a light application was mostly gone in four hours. Applied more heavily, it made it through most of a day, but was too flat for my taste by the early afternoon. Verdict: I don't think La Panthère will strike many perfumistas as feral, but it's beautifully done. It's interesting, unusual, easy to wear, and has a kind of luminous, radiant quality. I don't often think of perfume in synesthesia terms, but La Panthère struck me as having a golden glow that meshes nicely with the color of the juice. It's probably seasonless (ask me again in summer) and while it's not über-clean, I would think you could get away with it anywhere. Do I love it? Well, unfortunately for me, seeing as how I already own it, no. I like it, but I would not go any farther than that. If you make a habit of buying unsniffed, I hope you do a better job of it than I do. But I look forward to seeing where La Panthère goes next: if it follows the Baiser Volé trajectory, we'll get three or four variations over the next few years, and I will not be surprised of one of those turns out to be the one I should have waited for. Meantime, I've got a lovely 30 ml bottle that I wish had Baiser Volé's juice. If you are so inclined, do comment with your own buying unsniffed mistakes! 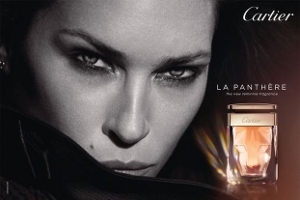 Cartier La Panthère is available in 30 ($72), 50 ($103) and 75 ($135) ml Eau de Parfum. 1. Via the Cartier YouTube channel. I do dig the bottle and might give it a sniff if I come across it at Saks or wherever. Sorry it didn’t work out so well for you. Something for the swap meet, perhaps? Yeah. Hopefully someone will show up with a 30 ml bottle of Baiser Vole they want to unload. My unsniffed mistake was Sacrebleu. It’s not that I dislike it, it just doesn’t seem ‘me.’ But since I bought it in the 30 ml bottle, I’ll probably still be able to use it up. Bought it because of Turin’s glowing review of it, which read like a prose poem. And I have to add that I don’t blame you one bit for your blind buy of La Panthere. One look at that fabulous bottle and I was coming up with excuses to buy it for that alone. Hey, that is another beautifully done perfume that doesn’t suit me personally! Will also add that Cartier does a nice job on the online sales…the box was beautifully wrapped in folded paper with a Cartier ribbon, and they included a little shopping bag. I have Sacrebleue Intense and I feel the same way! It sounded so fantastic, and it just doesn’t quite work for me. And there’s something in there that around the 45-minute mark starts smelling really off-putting sometimes; a spice, I think, that goes acrid. I still want Panthere! And um, at least the bottle is much much prettier than the Sacreblue one. The Nicolai one-ounces are so ridiculously ugly. To me La Panthere is a reworked, noble and more classical version of Yves Saint Laurent Belle d’Opium. It seems they took the floral oriental base of Belle d’Opium and deprived it of that synthetic sweetness. As a result I smell gardenia (it really dominates here) blended with pepper and softened by fruits. Could be — boy, did I dislike Belle d’Opium! If they follow the same order, I *think* Eau de Toilette will be next, then Extrait? But I can wait! Ohhhhh! Wow. You don’t even know how timely this is, Robin! I’ve been ready to purchase this unsniffed because I love Baiser Vole and Mathilde Laurent. But your post reminds me what a poor track record I’ve had in the past with purchasing unsniffed (though…I have to say I did purchase the BV extrait and essence unsniffed and love them both – not typical of my experience, though). I did read Denyse’s review over on Grain de Musc; and your review sounds good as well (though you didn’t love it). The problem with living in the boondocks – not easy to obtain samples. But I suppose I should sit on my hands and not do anything til I try it! Do not do it! If this was a Baiser Vole with gardenia I would have probably complained that it wasn’t new & different, but I would have loved it. It’s way fruitier, not in an unsophisticated way, but still, a very different style. OK! I won’t do it. Thank you! hmm, will keep an eye out for the flankers to come. Haven’t been a Cartier fan girl either, except for BV edt, which is a like rather than a love. Don’t know if it was a mistake, but recently blind bought some vintage Diorissimo–am so curious about it, and it’ll be easy to trade if I’m not enthralled. The vintage Diors I’ve tried so far have worked for me. I now have 2 versions of vintage Diorissimo & they’re both fabulous, hope yours works out! This has been the dreariest winter EVER. I am having the same urge–mailorder something new and exciting so that I’ll have the anticipation of waiting, the fun of opening a new package, and some novelty to break up the endless winter. I will probably order samples of something, despite having a gazillion samples around, dozens of which are untried. Wonder how many of us are having shopping urges for the same reason? It’s going to be costly if the weather doesn’t improve SOON. Yeah, I do think it’s good perfume (frankly, -very- good perfume for something as fresh as that) but after the “feral”, “animalistic” pitch, I was disappointed. But if they show up with an extrait, I would give it another shot! Were it to have a bit more body, I could be very interested. It’s really hard not to get worked up over all the ad copy, isn’t it? I really did not expect it to be feral — when’s the last time anybody did a mainstream feral? — but I did expect a little more bite than I got. It’s beautifully done, but would not call it a beautifully done gardenia. Maybe a beautifully done fruity musk? A beautifully done something. I think that it is very hard to love these modern, mass-market, focus-group tested fragrances that are being churned out. And for me, once I get to that ubiquitous word “musk” in the note line-up, I’m done. Funny you should ask about unsniffed purchases – I’ve bought almost nothing the last couple of years but recently read about a couple of Guerlains that I had never heard of. I found one of them, Secret Intentions, at Fragrancenet for a song so I, too, broke The Rule, and bought it unsniffed. While it’s a little more sharply green than I usually wear, it’s definitely growing on me, and it dries down to a very soft sandalwood with just a hint of vanilla. No Guerlinade for those who dislike it. There are some floral notes listed in the note line-up, but they are almost unnoticeable. I think it will be great for warmer weather, assuming it ever comes. Oh, I remember that one, it was pretty! Tea & jasmine, right? Yes, a very true tea scent, not the usual violet-leaning ionone. But I get very little jasmine or peony. And funny, I thought of you and that this was probably a Guerlain you’d like when I first spritzed! I truly love such a small percentage of perfumes I sniff that I hardly ever buy blind. Hardly every…unfortunately my one expensive nearly-blind buy reinforced this tendency. Sigh! That would be very nice! From the photos I do like the effect of the face in the glass ‘coloured’ by the perfume itself, but if the clarity of the image depends on light exposure, thats a bit unfortunate. It’s a subtle effect unless you’re looking at it straight on. But I do like it — it’s really quite nifty. And love bottles with no cap, because the cap is nearly always plastic anyway. It doesn’t sound like my kind of scent, but because I adore Le Baiser du Dragon, I’ll try another Cartier fragrance. I seriously disliked the Baiser du Dragon edp sample that was recommended to me, but someone suggested I get a sample of the pure perfume, and I was a goner. By that time, it was discontinued and available bottles were too pricey for me, but I got lucky and found one in Holland and I don’t know what I’ll do when it’s empty! If I’ve tried Baiser Vole, I’ve forgotten it (will have to get a spritz next time I’m at a perfume counter). Too bad that Cartier didn’t make any more exciting videos. I still regularly look at the L’Odyssée video, which I think is one of the most magical films I’ve ever seen! Yes, that was a really great ad! Did not really love the videos for Baiser Vole or this. Thanks for the review, Robin. I already mentioned how I feel about gardenia in the last lazy poll, so I’ll just ask how you find it compared to Jour d’Hermes? Well, gosh, I wouldn’t call JdH a gardenia scent either. This one is actually more focused on the gardenia, but JdH is more focused on the floral notes overall: I’d call JdH a floral, I’d call this something else, whether a fruity musk or a modern chypre. So this one is more of a gardenia but is less noticeably floral. Ha, did that make it worse? Hah, probably! I find the gardenia pretty prominent in JdH, so chances are Cartier won’t work. I’ll still sniff it, but at least I know that I don’t need to go out of my way to get hold of it. Sorry! I’m going to be surprised if you love this one though. I make far too many blind buys. Far too many. I’m trying to think of the last bad one I had and honestly I can’t say I’ve hated any of them. Some might not have been quite what I’d hoped for but I don’t remember any scrubbers or serious regret. I love this panther bottle. At least you bought something that’s nice to look at even if you aren’t thrilled with how it smells. This winter has been awful. I am so sick of these subzero temps. Why too many, if they are so often successful? It seems like blind-buying is only a problem if it leads to regret – or am I wrong? Its just a matter of time before my luck runs out. I need to get the ones I’ve sniffed that I know I’ll like instead of the ones I think I’ll like. Well you’ve been lucky! I think the second bottle I bought unsniffed was Caron Violette Precieuse, and I just HATED it. Swapped it away; now of course I’d love to have it back. Ha! Is it me or does the “panther” on the smaller bottle looks like a kitten and they look “older” as the bottle sizes grow? Huh, interesting … the face is less elongated & thus a bit less panther-like, but I do still think my bottle looks more like a panther than a kitty, but yeah, maybe a panther cub! I’m sorry but I don’t know. I have not yet seen it in a US department store online, but that doesn’t mean much. I think the SA at Saks was telling me it’s exclusive to them for the time being? Excellent, thanks! Were they selling it yet? They had a tester and were taking preorders–but this was last week, and I am pretty sure they said it would be available a few days later, so I bet it’s in the store by now. Aha, thanks also! So it’s everywhere, just not online yet. Ok, it’s now at Nordstrom’s website!! That bottle is ridiculously covetable. It could even house a men’s fragrance, with a different cap perhaps. And maybe silver instead of gold. Or – ooh! Gunmetal grey! Cartier gets my props for not churning out dime-a-dozen fragrances at a breakneck clip – they have one or two launches a year, and those tend to be of (relatively) high quality. And Cartier comes across as a genuinely sophisticated brand in an industry rife with faux-sophistication. To me no fragrance they’ve done since Déclaration has been a masterpiece, but Baiser Volé was very, very good. Agree, you could do silver cap, with a dark grey juice in a pale grey tinted glass. Do let them know! And agree. Delices de Cartier, maybe not, but since then they’ve done fine. That is a great bottle! This sounds like something that would work better in warmer weather – perhaps it will grow on you. I like two of Les Heures very much, LOVE Guet-Apens, and thought Baiser Vole was very well done (but too cool for me), so I definitely want to try this. Most of the Heures were too light for me though, so I won’t buy this unsniffed. I used to blind buy a lot on ebay, since I love vintage and discontinued fragrances, and it usually worked for me – more loves than regrets or mehs. Sometimes you really steal my thoughts Nozknoz (but you phrase them better ;))!! On blind buys – take away my perfumista card! I have done one single truly blind buy (mary Greenwell Plum – hate) in many years of perfume purchases! My version of a blind buy is to purchase a fragrance that I didn’t extensively test, and/or have not tested since a long time. These “blind buys” of mine have proved to be incredibly unsuccesful (like 100% unsuccesful? )…Love at first sight is an alien concept to my nose (and heart!)! My last (very expensive) mistakes have been Rodin’s fragrance based on Olio lusso (totally different from what I remebered it to be, and way too skanky) and Lumière noire – anything beats wearing a rose fragrance in my book, so I am still wondering why I thought that buying a FB of a pinkish rose would be a good idea. Anyway, do I get a prize for being the only NST reader to hate the panther bottle? I way prefer the diamond studded panther jewels at the Cartier shops…sigh. want. double sigh. Oh, I’m not in love with the bottle, either. Some discussion when it was announced pointed out its similarities to a prophylactic. . .
You know, I don’t think it will grow on me. It just isn’t my style. But you never know. After Denyse’s review I was doing the olfactory equivalent of salivating over this one. Add to that the fact that La Fougueuse is one of my all time Desert Island perfumes and Attrape Coeur dips in and out of that list and I consider myself a Mathilde Laurent fangirl. I’m still looking forward to sampling it at least and suspect a 30ml bottle (the best size/amount) will find its way into my collection as fruity and musky and chypre are all green lights to me. Have just nipped along the road and House of Fraser in the City doesn’t have it yet. Maybe next week. As a newbie (Stage 1 perfumista?) I blind bought a couple of Burberrys. One was the Sandalwood one (Gold?) which didn’t work out itself except that I swapped it for some Bois des Iles (total result!) and Red which has a top note of rhubarb and which I enjoy quite alot. Not toooo bad. Thank you! And do let us know if you love La Panthere. Interesting. Gardenia would be the last thing I’d associate with animalic/feral/panther-like. And it is even more at odds with the strong advertising visual (that looks like Erin Wasson). The opening reminded me of L’Heure Convoitee except that this has gardenia instead of carnations and since I already own LHC, I won’t be getting this one. Ah, interesting. Can’t remember if I smelled that one. I’m delightfully surprised when any recent release manages to smell like an honest-to-god, old-school chypre, and La Panthére truly does. I sniffed it at Sephora today and was duly impressed. It goes on strong, fruity, and almost hairspray-ish, but dries down to a lovely floral/woody/mossy essence that is catnip to my nose…no pun intended. And yet, it’s perfectly modern and fresh. You’re right, Robin, the oakmoss in La Panthére is done in a non-fusty/musty way, almost a platonic ideal of oakmoss: earthy without being acrid. And kudos to Mathilde Laurent. I’ve read some of her recent interviews where she basically poo-poohs the widespread hand-wringing over IFRA regulations and insists that great perfumes can be made under all the recent regulations, and perfumers who are panicking at their dwindling palettes simply aren’t trying hard enough, or are looking for a cop-out. (I’m paraphrasing, possibly egregiously, but whatever.) Her statements left me skeptical – perhaps she’s just towing the company line, given that she’s the contracted house perfumer at Cartier – but after smelling La Panthére, I’m actually swayed by her point of view. Perhaps the IFRA situation really isn’t the doom-and-gloom we (perfumistas) have been fed by the likes of Turin/Sanchez and name-your-favorite-fragrance-blog for the last half-decade or so. The industry, and the art of perfumery, seems to soldier on and make do. And in the case of this particular release, they make do quite well. On a lighter note, that bottle still tickles me pink. I am decidedly NOT a bottle whore, but…come on. 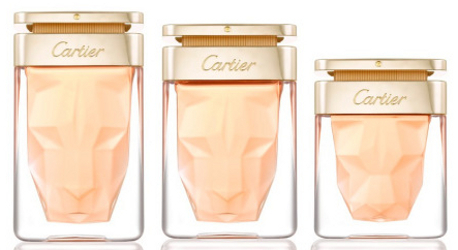 It’s a golden, shimmering, diamond-cut panther’s head floating in heavy block of glass. I am only human.